Gantry cranes come with multiple options and accessories, which can help to better tailor your system to your operation. One of the most useful options and accessories regarding gantry cranes is track mounting. Track mounting is useful for applications requiring lift and movement over a fixed route. Tracks are used for manual or motorized travel, depending on the type of gantry crane, type of track, and your operation. 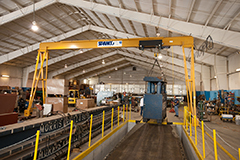 If you are considering a track mounted gantry crane, it’s important to know what types of tracks are most commonly offered, which will best serve your application, and their power drive options. Most manufacturers offer three types of track options for travel over a fixed route: V-Groove track, Guide Angle track, and Trackless—with or without guide angles. For manual travel over a fixed route or to track mount a lightweight or economical gantry crane, V-Groove track is your best option. V-Groove track requires a single installation without permanent ironwork, which makes it ideal for rented or leased facilities. V-Groove track, like Guide Angle track, bolts to your existing floor to allow your gantry to run smoothly and effectively. V-Groove track is constructed of inverted steel angles welded to a flat strip for use with 3/8-inch lag bolts with male/female ends for true alignment. Casters lock at 90-degree intervals to allow travel in a straight line and to help prevent movement under load when locked in opposable directions. V-Groove track comes in standard lengths of 5, 15, and 20 feet. Removable 5-foot track sections are ideal for facilities requiring clear lift truck passage. Each section is easily detached for safe travel without harming the V-Groove track. Removable 6-inch track sections are also available for use under overhead doors that need to be opened and closed. These removable V-Groove track sections ensure travel over a fixed route in almost any environment. A motorized V-Groove track uses two motor drives with rigid steel V-Groove wheels and V-Groove casters. V-Groove power drive kits are available for use with heavy-duty gantry cranes and are less expensive than trackless drives. That’s because trackless drives require polyurethane wheels while V-Groove wheels are made from steel. Power drives kits drive both sides of the gantry for guaranteed smooth and easy travel without manually pulling the gantry along. The second option for track-mounted gantries is the Guide Angle track, which is often used to power a heavy-duty gantry crane up to 10 tons. Guide angles are used on one side of the gantry, and the angles keep it moving in a straight line. Like V-Groove track mounting, Guide Angle track bolts to your existing floor, but only requires track along one side of the gantry’s route. Two motors on one side of the gantry crane drive trackless polyurethane wheels that are led by a small guide angle. Guide Angle track is ideal for gantries running along a wall, because the angle can be a trip hazard on open floor plans where it’s exposed to worker traffic flow. The guide angle simply lags into the floor at the base of the wall. For operations requiring an open floor plan, a trackless drive with or without a guide is available. Trackless gantries with a guide are similar to Guide Angle track because the guide is only required on one side of the gantry to keep it fully aligned. Like the Guide Angle track, trackless drive with guide angles works best near a wall to avoid creating an unnecessary trip hazard. Trackless power drives without guides are a perfect solution in a facility where track installation or guide angles are not an option. They require a selector switch in the control pendant to align the gantry if it comes out of alignment. The selector switch will turn each motor on and off as it travels to guide the gantry along its path and ensure continuous gantry alignment for safe travel. Power drive kits can be used with heavy-duty gantry cranes to allow high volume, high capacity travel along V-tracks, guide angles, or trackless paths. Power drive kits usually include two-drive assemblies with either polyurethane—for trackless drive—or V-Groove wheels for V-Groove track-mounted drive. As mentioned above, power drives for use on a trackless kit also include guide rollers on one drive and idler assembly. Idler and drive assemblies are usually supplied with polyurethane bumpers to keep equipment safe and fully operational.